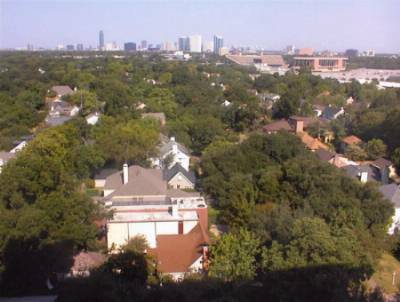 The photograph at left shows Houston, Texas on the morning that it shattered its all-time high temperature. Throughout the state several all-time highs were broken. These include 109°F at Houston, 112°F at Fort Worth (Meacham and Alliance), and 107°F at Corpus Christi. The all-time record high was tied at Victoria (110°F). 112°F was recorded at College Station. 111°F was recorded at Dallas-Fort Worth International, Mineral Wells, Waco, and Wichita Falls. 110°F was recorded at Arlington, Corsicana, Dallas Love, Lufkin, Terrell, Alice, Austin, Conroe, Huntsville, New Braunfels, and Victoria. All maps were created after-the-fact with saved METAR and upper air data using Digital Atmosphere. Digital Atmosphere is available for download on this site. 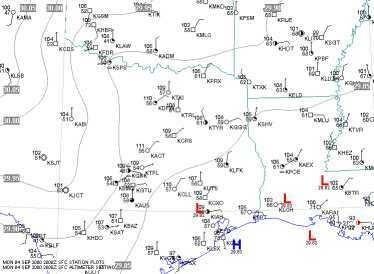 Low pressure and weak winds are noted across much of the eastern half of Texas. 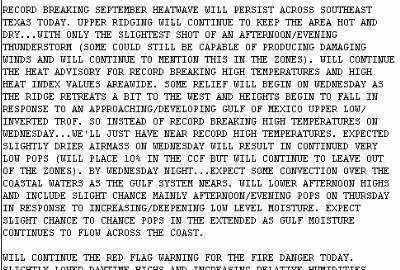 Temperatures ranged near 110 degrees through a broad area of eastern Texas. The 850 mb (5000 ft) chart showed high pressure centered on eastern Texas, with temperatures near 25°C. This is very warm for 850 mb and is supportive of extremely hot temperatures. The 700 mb (10000 ft) chart also showed high pressure, which was centered on north Texas. Temperatures were in excess of 10°C. 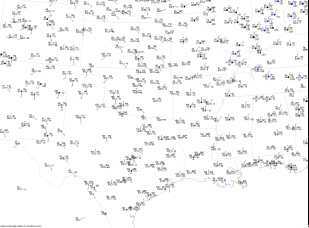 The warm 11°C reading in SW Louisiana and N Texas indicated where the strongest heating would take place. 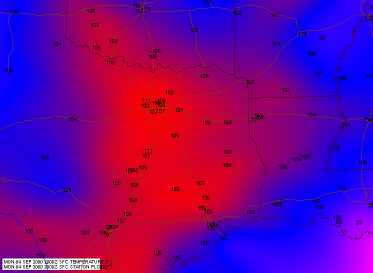 The warmer readings seen in west Texas are associated with the higher elevations and are not as indicative. 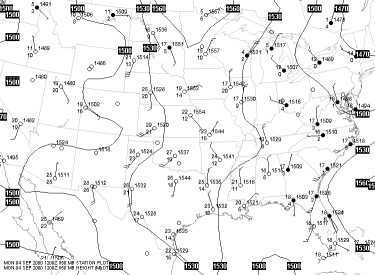 The 500 mb (18000 ft) showed a large subtropical high centered on west Texas. Large upper-level highs and ridges tend to be associated with above-average temperatures. 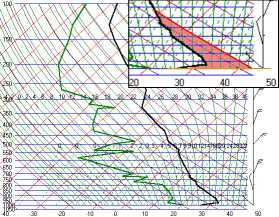 For those familiar with soundings, this is one from near the Houston area. Given a specific amount of solar heating, the geometric area between the temperature profile and the maximum temperature's dry adiabat is roughly constant. This region is shaded red in the inset. This concept of heating "area" can be used to get an estimate of the afternoon's high temperature. You be the forecaster! Presented here is a large map that you can analyze. Print it out (if your browser doesn't do a good job, save the map to disk and open it with a good paint program, then print it). 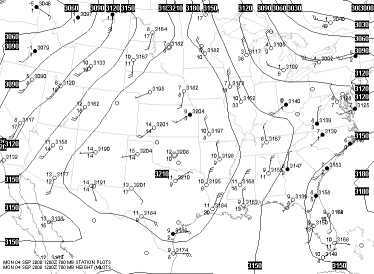 Draw isobars every 2 mb and locate all important fronts and boundaries. When you're done, click here for a solution as well as some interesting notes and annotations on what's going on.